Christmas is a holiday that is packed with rich traditions and history. Every year more than 400 million people around the world celebrate the holiday known as Christmas. Many people who don't embrace the religious aspect of Christmas still enjoy decorating a tree and exchanging gifts. Here are a few of the more popular Christmas traditions their explanations and origins. Even though the holiday is celebrated around the world by many diverse people groups and in various ways, there are some traditions that are uniquely American. For instance, Americans tend to watch movies and special programs around the Christmas holiday time. These special shows provide a chance to relax and get in a holiday mood during what can be a stressful time of year. Some of the favorites include "A Charlie Brown Christmas," Director Frank Capra's "It's a Wonderful Life," "The Christmas Story," "Home Alone," "Rudolf the Red-Nosed Reindeer," "Frosty the Snowman," "The Grinch Who Stole Christmas," "Elf" and "A Miracle on 34th Street." In addition to these older films, Hollywood usually opens blockbuster films during this time of year with hopes that Americans will be in the mood to go to the movies. As you plan your holiday schedule, keep watching these great movies, enjoy fire-side chatting, and continue eating popcorn. A decorated tree is usually one of the first decorative signs that the Christmas holiday season has arrived. 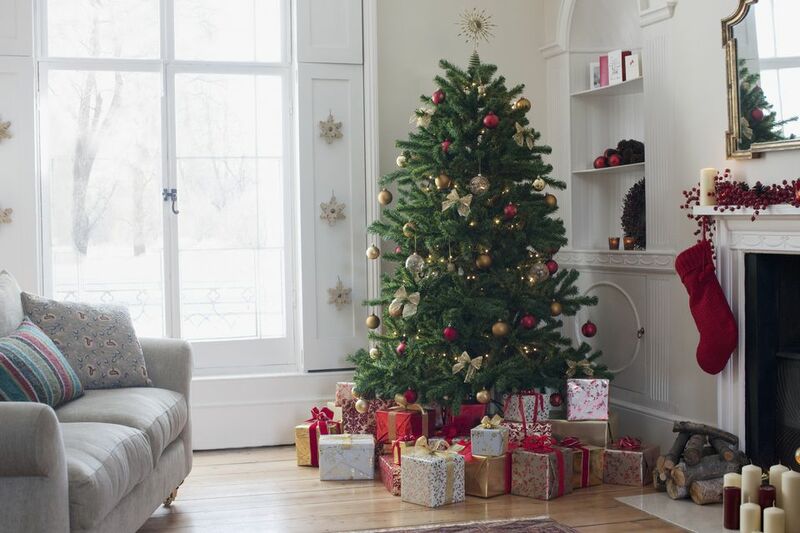 These evergreen trees may be natural or artificial and are decorated with all types of baubles, lights, tinsel, garland, and ornaments to suit each family or organization's particular taste. The history of the modern day Christmas tree is not comprehensive; however, we do know that there were reports of evergreen trees being decorated in Estonia and Latvia as early as the 15th century. A Christmas tree decorating party is always a great idea for holiday fun. Invite each guest to bring along a unique ornament and have fun with music and a light fare as you trim the Christmas evergreen. Those delicious candy treats date back as far as 1670, in Cologne, Germany. The most popular account is that a choirmaster wished to quiet the children in his church, Cologne Cathedral, during their yearly Living Cherche tradition each Christmas Eve. He reportedly commissioned a local candy maker to create what he referred to as sweet sticks for the children. He specified that they should have a crook at the top of each stick, to remind the children of the shepherds who visited the baby Jesus. He also specified that he should use the color white in order to teach the children about Christianity and remind them of Jesus’ sinless life. Apparently this trend caught on quickly and spread throughout Europe where other congregations began to hand out the candy canes during nativity plays. The candy cane’s peppermint recipe was first published in 1844, and it was first mentioned in a work of literature in 1866. The earliest patent for a candy cane machine was filed by the Bunte Brothers of Chicago, Illinois, in the year 1920. The candy cane is a popular alternative to bulbs and ornaments for Christmas tree decorations in America. The association of gift giving with Christmas goes back to the original Christmas when the Magi brought gifts to the Christ child. These gifts: frankincense, gold, and myrrh were given to the baby Jesus for his security and in goodwill. Today, those who celebrate Christmas carry on the tradition of giving to others for the joy of giving. Many believe that the Christmas holiday has become so commercialized that there is no longer the altruistic purpose behind the practice of giving. As you buy gifts and give during Christmas, do so in the spirit of etiquette and the Golden Rule of doing unto others as you would have them to do unto you. Sending and receiving Christmas cards is a great way to communicate with friends and loved ones who live far away. They let people know that you are thinking of them and hoping for their best during the Christmas holiday season. Within the United States of America, more than two billion Christmas cards are exchanged annually. Christmas is the number one card-selling holiday of the year. The phenomenon that began around 1822 in America caused the Superintendent of Mails to declare that he would have to hire an additional sixteen mailmen in order to handle the delivery of the handmade Christmas greetings. By the year 1843 London was producing and selling commercialized Christmas cards. Most of these cards were costly. Regardless, most people loved the idea and Christmas cards are still immensely popular to date. Don't forget to mail yours out with a special handwritten greeting for that extra personal touch. You might want to buy some extra cards to send out when you remember people you forgot to put on your list. What Does 'RSVP' Actually Mean?